Somewhere between invasive security measures and late arrivals, good stuff still happens in air travel. This month, American Airlines and Aircell debuted Gogo Vision, a service that puts entertainment in the traveler’s hands. 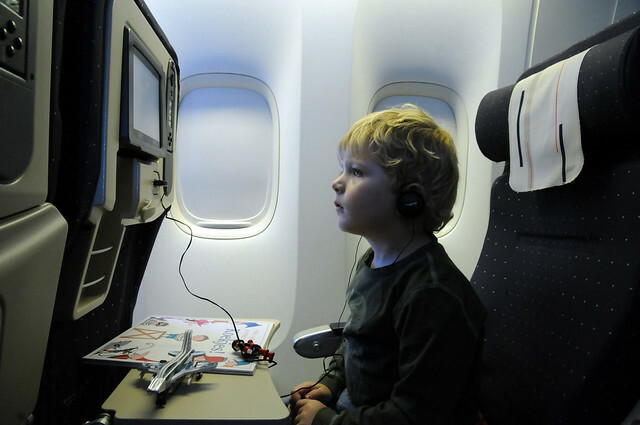 It could also put an end to those tiny seatback monitors. Good news about air travel is rare these days, but somewhere between invasive security measures and late arrivals, increasing fuel prices and frustrated flight attendants, it happens. Making the skies a bit friendlier this month, American Airlines and Aircell debuted a new service–Gogo Vision–that lets travelers watch streaming video content inflight on their own gadgets. Specifically, travelers aboard American Airlines 767-200 aircraft between New York and Los Angeles, or New York and San Francisco now have access to Aircell’s Gogo Vision. The deal marks the first effort by a major airline to let passengers stream video content to their own devices–from iPads and iPhones, to Android phones, or newly liquidated HP TouchPads–rather than a backseat screen or other airline provided gear. To start, 15 of American Airlines’ Boeing planes will be rigged up with Gogo Vision. The service features about 100 movies and TV shows from studios including NBC Universal and Warner Brothers with more to come. Gogo charges $3.99 for a movie, and $.99 for a TV show. Trailers for all content are free to view. Customers get 24 hours after the plane has landed to watch rights-protected versions of any movies they rented, or 72 hours for TV shows. Aircell chief marketing officer Ash ElDifrawi believes Gogo Vision is a “game-changer in the world of inflight entertainment,” not just because of the content it provides passengers, but because it enables personal devices as an access point. A rental library of just 100 movies and TV shows doesn’t seem like much when a 64 gigabyte iPhone can store dozens of movies, or thousands of songs. Still, Gogo Vision could spell the end of “seatback entertainment” in planes. American Airlines’ vice president of marketing, Rob Friedman, predicts that other airlines will scramble to offer a similar service, soon. “Letting our customers own the technology while we give them content to download at their own discretion is a terrific option for people who like having that control,” he said. More than 70 percent of fliers carry a Wi-Fi-enabled device already, reports Niels Steenstrup, VP of product at Aircell. Entertainment systems with a screen for every passenger can cost as much as $500,000 to install per plane. An Aircell unit that enables Gogo Vision weighs less than 100 pounds, costs between $10,000 and $20,000 and can be installed overnight, Steenstrup reports. Another consideration for cash-starved airlines is the weight of all that gear, and the extra fuel costs and pollution associated with hauling it. Remember when Japan’s All Nippon Airlines asked passengers to empty their bladders before boarding so planes would fly lighter and burn less fuel? Today’s smart tablets, such as the iPad, also have a larger screen than most seat back entertainment units offering a potentially better viewing experience. Aircell provides Gogo onboard Wi-Fi to about 1,200 Internet-enabled commercial aircraft in operation globally. Through a combination of its air-to-ground antennas, and a satellite network, its Gogo service is the Internet carrier for an additional 5,000 business jets and private aircraft. The limits of how much content could be available to the captive, flying audiences via Gogo is set by the upper bounds of storage space on aviation-compliant servers, Steenstrup says. These are at least a generation behind what is widely available for commercial use. The limits also have to do with Gogo’s ability to ink deals with major studios, namely to license rights-protected versions of their films for in-flight rentals. Content streaming agreements with aggregators may also be in the offing. Steenstrup declined to divulge details, but did say that Gogo is in talks with several big-name video game studios to provide yet another layer of in-flight entertainment, as well.